It happens all the time. “Great Company” sells for a great price and “Good Company”, which is another similar company in the same industry, gets a very disappointing valuation. In fact, it is very common to see Great Company get a valuation two to three times that of Good Company. Why is that? We only need two simple things to provide the answer. Buyers base their valuation of a company primarily on two items: “EBITDA” and the “multiple”. EBITDA means earnings before interest, tax, depreciation, and amortization. While it is not the same as cash-basis earnings, it is used as a ready approximation for operating cash flow. The multiple is the number of times EBITDA a buyer will pay for the company. If the trailing twelve months EBITDA is $3 million and the multiple is 8 then the company would have a valuation of $24 million. In our Great vs. Good example above, both companies have annual revenues of $50 million in an industry with total annual revenue in the US alone in excess of $1 billion. They also have similar products in quality, similar production facilities, and management teams that know the industry. They see each other frequently at trade shows where both have impressive booths and fine, good-looking sales people. To the outside world, these two competitors look equivalent. 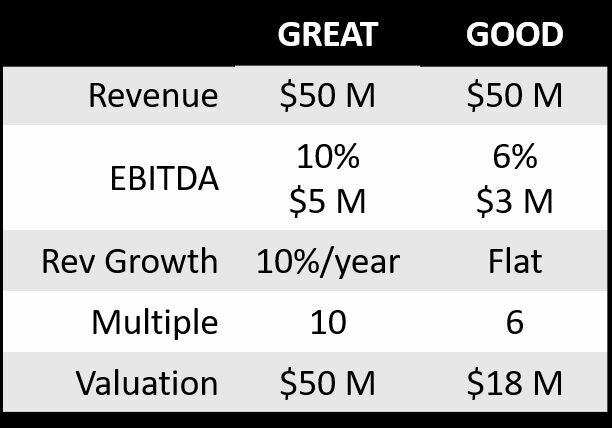 However, Great Company has an industry average EBITDA percentage of revenue of 10%, i.e., EBITDA is $5 million, and Good Company has 6% and therefore its EBITDA is $3 million. Moreover, Great Company has revenues growing at a reliable and predictable rate of more than 10% per year. 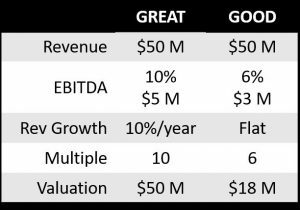 Good Company on the other hand has had its revenues stay flat for the last two years and it does not have a clear and documented strategy to change that. Also, Good Company’s product prices are not as high as Great Company’s even though its product quality is equivalent, and its product costs are a little higher than Good Company. Accordingly, Good Company has a gross margin materially below that of Great Company. Interestingly, and very commonly, in an attempt to boost earnings, Good Company has responded to this by reducing its expenses in recent years including cutting back on sales, marketing, systems, R&D, and pay increases – which have together in the aggregate made things worse. Consequently, in the harsh, Darwinian world of private equity, the multiple offered to Great Company is 10 whereas Good Company is offered 6. So Great Company gets a valuation of $5 million x 10 = $50 million. And Good Company gets offered $3 million x 6 = $18 million. This dramatic difference is always a shock, understandably, to owners of companies like Good Company. The fortunate news, given the facts stated above, is that Good Company can improve significantly, comparable to the performance of Great Company, by doing some basic things which are part of a value creation plan. In fact, Great Company isn’t really “great” as it has only an industry average EBITDA margin. And there is lots of room for both companies to grow in this reasonably large industry. There are at least 1,000 Private Equity firms in the US looking to get a bargain by buying companies like Good Company. Now, $18 million is not a bad pay day for the owner of a Good Company. But the truth is that the PE firm buyer will probably sell the company again in a few years for more than double what they paid. This is stealing the true value from the company’s founders and their families. The PE firms do this by making changes the owners could have done for themselves – if they had had some help. Hope all is well and look forward to seeing you again.